The volume also contains a Tudor genealogy, a thorough chronology of the Henrician era, and appendices reprinting interesting documents, including an embattled letter from Henry's first wife and a list of censored passages in an early folio text of Shakespeare's Henry VIII. Yet all of these aids are clearly secondary compared with the catalogue entries themselves. They are why some readers will be perusing this volume attentively, returning to it again and again. The several portraits by Hans Holbein are unsurprisingly ravishing. John Guy in his essay on royal power claims that Henry "struck gold" when he found Holbein, whose inimitable style created a kind of "brand" for the king and his court. 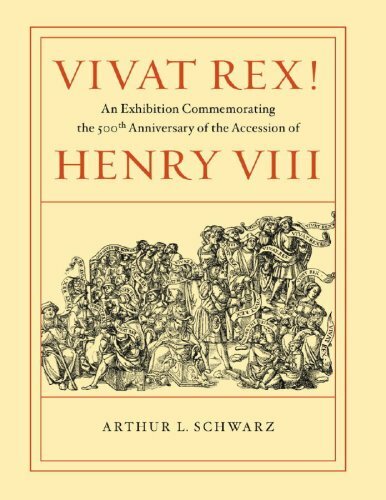 Texts represent the majority of the exhibition's objects, and Schwartz points to the coinciding "advent of printed books" to explain Henry's popularity and historical durability. Several remarkable editions are represented. For example, Henry's schoolboy copy of Cicero's De officis features the inscription, "Thys Boke Is Myne," an early sign perhaps of the possessive streak that England's displaced monks would come to rue. Several religious treasures appear here: a Book of Hours belonging to Henry's mother, Elizabeth of York, and the Golden Gospels of Henry VIII, a 10th-century manuscript thought to be a gift from pope Leo X, following Henry's Assertio against Martin Luther. This modest effort earned Henry the title "Defender of the Faith," but it also made him embarrassingly vulnerable to the stout replies of Luther, who called him "dear Junker" and "King Harry" by "God's ungrace." The most important of these books are the early English Bibles. Contrasting title pages reflect the massive shift in Henry's sense of himself as a sacred ruler. On the 1535 Coverdale Bible, Henry appears at the bottom clearly receiving the scriptures from his clergy, while the more fully approved Byble in Englysche (1539) features the king appearing rather godlike at top center, handing the Good Book to his ministers Cranmer and Cromwell on each side. The speech balloons surrounding this image proclaim, "God save the Kinge" and "Vivat Rex!" A final group of objects contribute to a long, conflicted record regarding King Henry's posthumous reputation. One Englishman in 1769 speaks of "an honest open-hearted man" and "Patriot King," while Arthur Sullivan in an 1877 arrangement points to Henry's purported authorship of the lyrics, "Youth Will Needs Have Dalliance." An image arises here of a jolly, ballad-singing ruler. Other assessments, however, shimmer in revulsion. For Walter Ralegh, who knew something about royal caprice as a prisoner in the Tower, Henry VIII was a "mercilesse Prince" who cut off and cast off those closest to him. In his Child's History of England, Charles Dickens describes the king as "one of the most detestable villains that ever drew breath" and "a blot of blood and grease." Other dismissals have more levity, such as a cartoon from Punch that portrays Henry as a weeble-wobble buffo hunting on horseback a fleeing monk. With that chase scene in mind, allow me to mention a curious phenomenon during my writing of this review, done near the medieval mountain town of Todi, in Italy. As it turns out, Todi's ancient Latin name is Tuder, and one still encounters it in shop windows, road signs, and business names (Tudernum Vini, for example). As I've been writing, and offering my own comments on Henry VIII rather recklessly, it has felt as if the royal name of "Tudor" is finding me out at every corner. Perhaps this impression, and association, is merely odd, or perhaps it speaks somehow to the ongoing force of Henry, the Tudor line, and its legacy.